Don’t hurt me. I’m fixed. On the streets of colonial Trinidad. The falling rocks of Lubaantun. Xochicalco, one of the hidden treasures of Mexican archaeology. These crude markers honor Argentinian heroes. Watching the bandoneonistas manipulate their instrument is one of the joys of seeing and hearing Tango played live. Tango is Buenos Aires. Tango is Argentina. Tango was born in the slums of turn-of-the-20th-century Buenos Aires, where weary laborers translated their day-to-day burden into a mix of African and American musics that is the Argentinian equivalent of the Blues in the U.S. Today, Argentinians of all ages embrace Tango culture and share it with millions of tourists from around the world. The gathering where people dance tango is called a “milonga.” Milongas can be a regular event that occurs in any space where people can dance. On any night of the week in Buenos Aires, you can find several different milongas. Some of them have been running for many decades. The venues for the milongas range from dance halls, night clubs, and cafes to empty warehouses, social halls, and community centers. One of the more famous and definitely most beautiful venues was the Confiteria Ideal in central Buenos Aires, which was open for more than 100 years until it closed in 2017. A long time ago, the Argentinians coined a special word, “trasnochando,” that loosely translates as “partying all night.” Traditionally, many tango clubs have stayed open until dawn, no matter which day of the week they may meet. 100 years ago, the music would have all been live. Today, the dancing is mostly to recorded music. In fact, even when live musicians do play, they usually don’t start playing until after 1 a.m. and play for only about 45 minutes. A busy milonga going on at the Club Gricel in Buenos Aires. Orquesta Colortango de Roberto Alvarez performs for the dancers at the Milonga Parakultural in Salon Canning in Buenos Aires. Orquesta Misteriosa performs at the La Viruta Tango Club in Buenos Aires. Orquesta Tipica El Afronte plays at their regular Maldita Milonga in the Buenos Ayres Club. For many years, at the corner of Humberto Primo and Defensa on Sunday afternoons, this same guy has been dancing Tango with tourists on his little portable dance floor. Salon Canning is one of Buenos Aires’ most popular and long-running venues. Here, the dancers fill the floor at the Sunday afternoon A Puro Tango milonga. 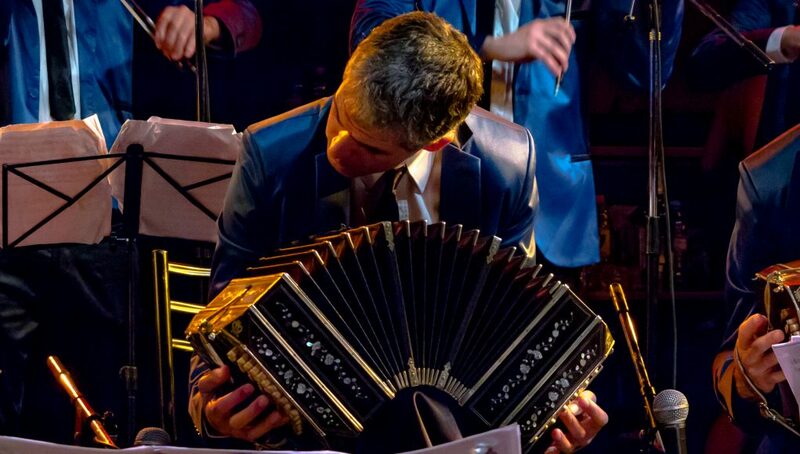 The accordion-like bandoneon is the essential Tango instrument and is symbolic of Tango and Buenos Aires. The legendary Confiteria Ideal, which was one of Buenos Aire’s most popular Tango venues, was open from 1912 until it was closed just recently. The Orquesta Tipica La Juan D’Arienzo performing at La Viruta Tango Club in Buenos Aires. Previous articleOn the streets of colonial Trinidad. Next articleDon’t hurt me. I’m fixed. First published in 1995, seekpeace.com is the online home of Mike Cuenca. All content is copyrighted and all rights are reserved.